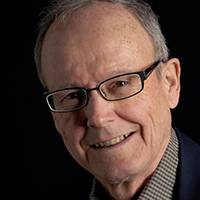 Stephen Nichols | Mayapple Center for the Arts and Humanities, Inc.
Stephen G. Nichols is James M. Beall Professor Emeritus of French and Humanities, and Research Professor at Johns Hopkins University. He co-founded the electronic journal, Digital Philology, A Journal of Medieval Culture, and Codirects JHU’s Digital Library of Medieval Manuscripts. One of his books, Romanesque Signs, received the Modern Language Association's James Russell Lowell Prize for an outstanding book. He’s a Fellow o the American Academy of Arts and Sciences, A Fellow of the Medieval Academy of America, an Honorary Senior Fellow of the School of Criticism and Theory, and a Distinguished Presidential Fellow of the Council of Library Information Resources. He was awarded an honorary Docteur ès lettres from the University of Geneva and an Alexander von Humboldt Research Prize from the German government. Recent books include: Philology, History, Theory: Rethinking the New Medievalism; The Long Shadow of Political Theology; Rethinking the Medieval Senses, and a new, augmented edition of Romanesque Signs, Medieval Narrative and Iconography.